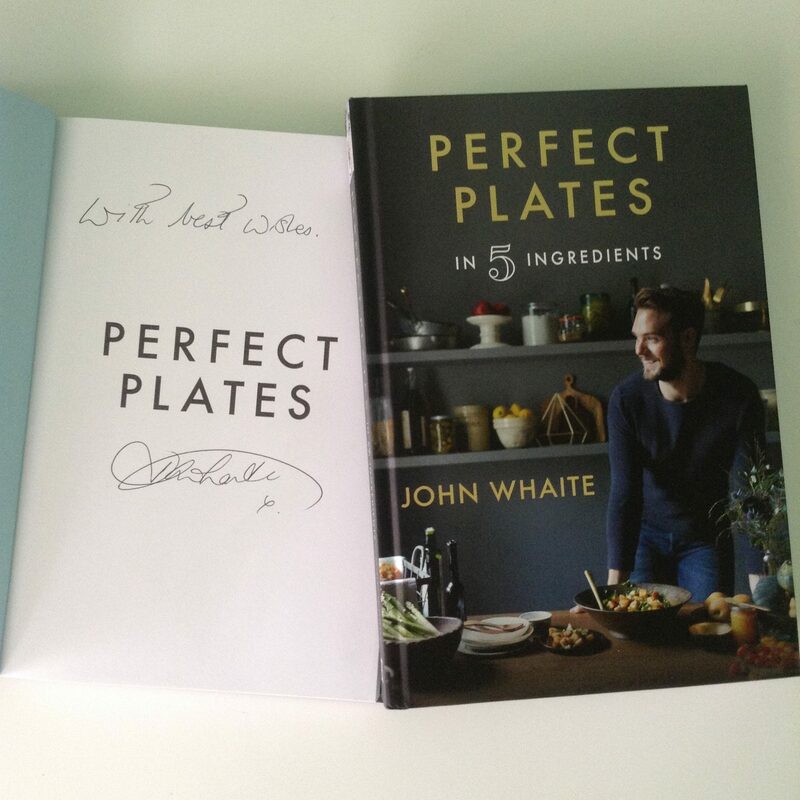 For the final giveaway of my Blogaversary celebrations, the beautiful John Whaite has signed 2 of his Perfect Plates In 5 Ingredients recipe books for me to giveaway. John won the third series of The Great British Bake Off in 2012. He now writes for The Telegraph, is a resident chef on Lorraine, is a presenter and judge on the daytime cookery competition show The Chopping Block and has opened his own cookery school. Perfect Plates In 5 Ingredients is divided into Weekend Morning Plates for breakfasts and brunches, Hearty Plates of comfort food, Everyday Plates for easy week-night suppers, Worth the Wait Plates for slow cooking, Posh Plates for easy, impressive dishes, Many Plates for sharing and finally Sweet Plates for simple cakes and sweet treats. Each recipe can be created using only 5 ingredients, excluding store cupboard essentials such as oil, salt and pepper. I absolutely love the simplicity of these recipes, making it easy enough for a novice cook like me to create impressive dishes. My favourite recipe in the book is the chocolate cake with a secret ingredient, oh my goodness, it is amazing! I have lots of favourite recipes but the one I am loving right now in my tuna steak in a garlic and herb marinade recipe! Entered, would love one of these! I like to make a chocolate cake. My favourite recipe to make is cottage pie, the whole family loves it. I love making pavlova, because I have a wonderful foolproof recipe, so it always works!! Enchilada, though I doubt it’s anything resembling authentic! My fajitas always go down well. I love making chicken curries! i love baking toffee apple fudge cake nom nom ! What interesting books, fingers crossed! My favourite bake is biscotti and I love to try out different flavour combinations. My favourite recipe has to be chicken korma as it’s my favourite meal to cook and eat. I love making cauliflower cheese with home-made cheese sauce. Oooo awesome! I’d love to win! Ooooooooooo I love this and a girl can never have to many shoes, bags or cook books going to make sure I’m in it cos I want to win it !!! I like to make ham and mushroom omelette with buttered crusty bread. I love making spag bol – my girls love it! Simple but the best! Can’t beat a home made veggie lasagne – it always gets demolished quickly at the dinner table! Pasta Arrabiata and funnily enough that uses very few ingrediants too. Chopped Tomatoes, Pasta, Bacon, Chilli Flakes and Italian dried herbs! I love making different curries. I don’t cook now, pesky MS, but I love eating (does this count?) my partner’s Yorkshire puddings, made as her great uncle showed her. I love a good mixture of things but Cottage pie is a favourite, I absolutely love recipe books to help me on my way! Hmm hard to choose one, but at the moment I think it’s my sweet potato, tuna and avocado salad recipe! Love a good toad in the hole! I love making a good spag bol! I love making curry from scratch. So easy to eat no meat when it’s Indian. I love a traditional Sunday Lunch. I love making roast pork, and pinching all the best bits! I love cooking, my favourite at the moment is chicken pie. I love that I can actually do it!!!! I love making a 5-Bean Veggie Chilli, Chinese-Style Chicken in Black Bean Sauce Stir Fry and I love baking Devil’s Food Cake! Cupcakes with help from my nephew. My favourite at the moment is a glazed lemon and chia/poppy seed bundt cake – it’s amazing!